Background: The neonatal arterial switch operation (ASO) is now the standard of care for children born with transposition of the great arteries. Stenosis of the neopulmonary artery on long-term follow up is a known complication. Methods: We performed a retrospective analysis of eleven patients who underwent a cardiac magnetic resonance imaging (MRI) due to echocardiographic evidence suggestive of stenosis of the neopulmonary artery or its branches (mean estimated Doppler gradient 48 mmHg, min 30 mmHg, max 70 mmHg). A comprehensive evaluation of anatomy and perfusion was done by cardiac MRI. Results: The branches of the neopulmonary artery (neo PA) showed decreased caliber in three patients unilaterally and in two patients, bilaterally. Magnetic resonance (MR) perfusion studies showed concomitant decreased flow, with discrepancy between the two lungs of 35/65% or worse, only in the three patients with unilateral obstruction, by two different MR perfusion methods. Conclusions: Cardiac MR can be used as a comprehensive non-invasive imaging technique to diagnose stenosis of the branches of the neopulmonary after the ASO, allowing evaluation of anatomy and function of the neoPA, its branches, and the differential perfusion to each lung, thus facilitating clinical decision making. Cardiac magnetic resonance imaging (CMRI) is a useful technique to study patients with operated congenital heart disease, especially many years after surgical repair due to inadequate echocardiographic views. We report our experience in patients with suspected stenosis of the branches of the neoPA after the ASO, using a CMRI protocol that included morphological analysis, phase-velocity studies to evaluate flow and angiography using a gadolinium-based contrast. The study was conducted over a 24 month period (200 9-20 011), during which 60 patients who had undergone the ASO, within 30 days after birth, had routine echocardiographic studies in the pediatric or adult congenital heart disease clinic. Eleven patients showed findings suggestive of stenosis of the neoPA or its branches with a mean estimated Doppler gradient 48 mmHg (min 30 mmHg, max 70 mmHg). These patients then had CMRI exams on a GE 1.5T HDxT system with a 8-channel cardiac coil, with ECG gating and apnea for some sequences. After an axial scout, a black blood sequence with T1-weighting was acquired in the axial plane to visualize the neoPA and its branches. Then, axial cine imaging was performed. Subsequent cine imaging of the neoPA in a sagittal orientation was performed to delineate the PA trunk, after which a perpendicular cut was made to perform a phase-velocity study with the patient breathing freely. After this, a cut was made perpendicular to each branch of the neoPA and a phase-velocity study was repeated. If flows and morphological appearance confirmed the presence of stenosis anywhere, then an angiographic sequence (either bolus-tagged or time-of-flight) was performed to assess the extent of the stenosis and its morphology. Towards the end of the study, a phantom was placed in the unit and all phase velocity sequences repeated on the phantom while the patient was either seated in the room or placed on a table with continued electrocardiographic monitoring for gating purposes. This sequence was then used for background correction and final analysis in the flow studies. The differential perfusion by each method was correlated as well. 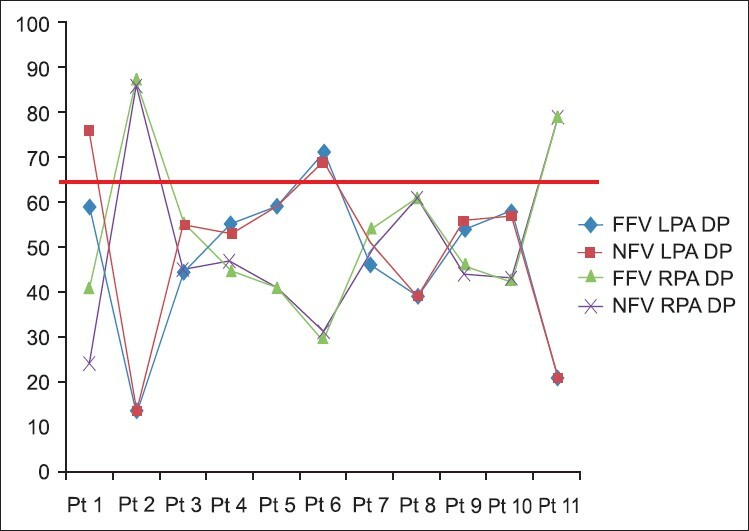 The regurgitant fraction (RF) of each branch was then calculated as BFV/FFV and expressed as a percentage. For practical purposes, mathematically, a larger RF with decreased NFV on one side would imply a smaller differential perfusion to that lung (when using the NFV method). In the NFV method, a higher regurgitant fraction, accentuates the difference in perfusion between the two lungs. A flow discrepancy between the two lungs of 35 or 65% or worse has recently been recommended as a threshold for intervention in a BPA. Gradients were not calculated across sites of stenosis due to technical problems inherent in the phase contrast MR technique. Anatomic diameters were calculated as an indicator of stenosis despite the pulsatility of the neoPA and branches. On the cine sequences, the smallest branch diameter (irrespective of the phase of the cardiac cycle) was used to calculate the Z-scores of the neoPA and its branches. The detailed anatomical and flow parameters for each patient we studied are presented in [Table 1], [Table 2], [Table 3]. The neoaorta was dilated in nine patients and compressed the trunk of the neoPA in three patients. The branches of the neopulmonary artery showed a decreased caliber in three patients unilaterally and, in two patients, bilaterally. MR perfusion studies showed concomitant decreased flow, with discrepancy between the two lungs of 35 or 65% or worse, only in the three patients with unilateral stenosis, by two different MR perfusion methods. Five patients had stretching of the branches of the neoPA without any difference in the differential perfusion. In one patient with bilateral stenosis on anatomic images, the NFV method gave 26% perfusion to the right side while the FFV method gave 41%. In spite of the discrepancy in this case, a strong correlation between the two methods (FFV and NFV) was detected (r = 0.947, P < 0.001). In the other patient with decreased caliber of the branches bilaterally, the cause appeared to be stretching of the branches over a dilated neoaorta. In this patient, despite an anatomic decrease in the caliber bilaterally, no difference in differential perfusion was noted. NeoPA and neoaorticvalvular regurgitation, when detected were clinically insignificant [Figure 1]. The cause of increased Doppler gradient was therefore ascertained to be compression of the trunk of neoPA in three patients, unilateral branch stenosis in three patients, bilateral branch stretching with compression in two patients and stretching of one or both branches without compression in three patients. The patients in our series were investigated using CMRI after echocardiography. They showed evidence of significant right-sided obstruction namely increased velocity at the RV-PA junction, increase in the velocity of the jet of tricuspid regurgitation or altered interventricular septal motion, indicating high RV pressures. The exact location and quantum of obstruction may be difficult to judge by echo. CMRI confirmed the presence of significant flow difference of greater than 65 or 35% in one lung, compared to the other, using both methods, in only three patients. 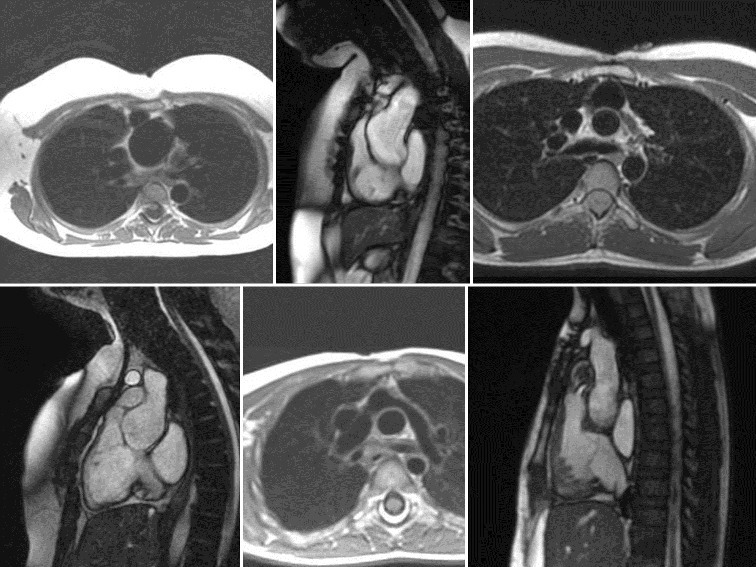 These three patients had unilateral obstruction predominantly on anatomic images. Flow studies by CMRI, devoid of radiation, obviate the need for perfusion scintigraphy studies to evaluate differential flow to the lungs and have been validated against scintigraphy. Therefore, scintigraphy was not performed in any of our patients but may be useful in those with discrepant findings by the two methods we used. Although, we feel that one of the strengths of our study is the use of two methods to calculate the differential perfusion to each lung, some important caveats should be kept in mind. 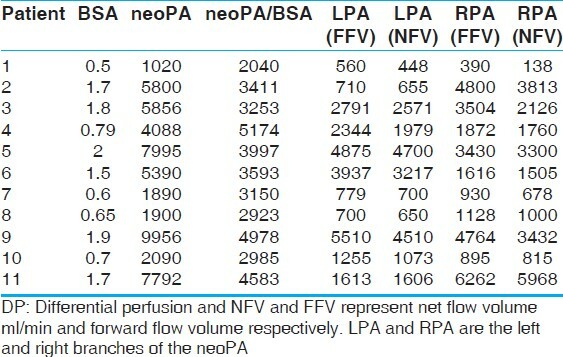 One group has shown that in patients with previously operated tetralogy of Fallot (TOF), the conventional NFV method underestimated left lung perfusion and they attributed it to a greater regurgitant fraction in the LPA  and the FFV method correlated better with perfusion scintigraphy. In one patient in our series, intervention would have been recommended for the right branch of the neoPA, by the results of one method (NFV) but not by the other (FFV) (patient 1 in [Figure 2]). This patient had a regurgitant fraction of 64% in the right branch and this may have accounted for the significant difference in both methods. To the best of our knowledge, there are only two studies that have addressed this problem using CMRI methods. , One study  reported that the branches of the neoPA had different diameters during systole (smaller) and diastole as the neoaorta enlarged during systole compressing one or both branches. We also evaluated the diameters of the branches and have noted that a severe narrowing, confirmed by the Z-score of the stenotic branch, is accompanied by a decrease in perfusion to the lung supplied by that branch. We have also used a phantom correction method to avoid analytical errors as recommended by recent studies. , All flow studies in our cohort were performed with the patient breathing freely, which is more physiological than apnea. In our study, the enlargement of the neoaorta, was a causative factor in the compression of the trunk or stretching of the neoPA or its branches in most of the cases. This is based on our findings on cine imaging where systolic expansion of the neoaorta compresses the branches or the trunk of the neoPA. In some cases, where we observed that the decreased branch diameters were due to the stretching of the branches over the dilated neoaorta, the Lecompte maneuver may have accentuated this. We cannot rule out the possibility that an acute angle at the bifurcation of the neoPA after the Lecompte maneuver was also a contributing factor to any Doppler gradient detected on echocardiography. The evolution of the neoaortic and neopulmonary roots after the ASO has been studied. Some authors have reported the neopulmonary valve to be abnormally small or even dysplastic. In contrast, the neoaortic valve tends to enlarge after the ASO. While the neoaortic root and the annulus is larger after the ASO, compared to normal controls, the diameter at the anastomotic site in the aorta is decreased. The dilatation of the neoaortic root is progressive while the annulus remains stationary after a while. This was a retrospective analysis of cases in our database where image acquisition had been left to the discretion of the imager. Pulmonary vein flows were not obtained in this study, that could have been useful for internal validation of the flow parameters. RV dimensions and volumes were obtained only in a few patients. The technique is more accurate in unilateral narrowing, if there is bilateral narrowing, flow can be reduced to both lungs while maintaining a differential perfusion that may be equal on both sides. A comprehensive CMRI can be used as a non-invasive imaging technique to diagnose stenosis of the branches of the neoPA after the ASO. Differential perfusion analysis in each lung by the phase velocity method and anatomical findings of narrowing should be the considered in the clinical decision-making for these patients. 1. Jatene MB, Jatene IB, Oliveira PM, Moysés RA, Souza LC, Fontes V, et al. Prevalence and surgical approach of supravalvular pulmonary stenosis after Jatene operation for transposition of great arteries. Arq Bras Cardiol 2008;91:17-24. 2. Bové T, De Muelder F, Vandenplas G, De Groote K, Panzer J, Suys B, et al. Midterm assessment of the reconstructed arteries after the arterial switch operation. Ann Thorac Surg 2008;85:823-30. 3. Giardini A, Khambadkone S, Taylor A, Derrick G. Effect of abnormal pulmonary flow distribution on ventilatory efficiency and exercise capacity after arterial switch operation for transposition of great arteries. Am J Cardiol 2010;106:1023-8. 4. Wu MT, Huang YL, Hsieh KS, Huang JT, Peng NJ, Pan JY, et al. Influence of pulmonary regurgitation inequality on differential perfusion of the lungs in tetralogy of Fallot after repair: A phase-contrast magnetic resonance imaging and perfusion scintigraphy study. J Am Coll Cardiol 2007;49:1880-6. 5. Feltes TF, Bacha E, Beekman RH, Cheatham JP, Feinstein JA, Gomes AS, et al. Indications for cardiac catheterization and intervention in pediatric cardiac disease: A scientific statement from the American Heart Association. Circulation 2011;123:2607-52. 6. Gandhi SK, Pigula FA, Siewers RD. Successful late reintervention after the arterial switch procedure. Ann Thorac Surg 2002;73:88-93. 7. Lupinetti FM, Bove EL, Minich LL, Snider AR, Callow LB, Meliones JN, et al. Intermediate-term survival and functional results after arterial repair for transposition of the great arteries. J Thorac Cardiovasc Surg 1992;103:421-7. 8. Nogi S, McCrindle BW, Boutin C, Williams WG, Freedom RM, Benson LN. Fate of the neopulmonary valve after the arterial switch operation in neonates. J Thorac Cardiovasc Surg 1998;115:557-62. 9. Sridharan S, Derrick G, Deanfield J, Taylor AM. Assessment of differential branch pulmonary blood flow: A comparative study of the phase contrast magnetic resonance imaging and radionuclide lung perfusion imaging. Heart 2006;92:963-8. 10. Gutberlet M, Boeckel T, Hogsten N, Vogel M, Kühne T, Oellinger H, et al. Arterial switch procedure for D-transposition of the great arteries: Quantitative midterm evaluation of hemodynamic changes with cine MR imaging and phase-shift velocity mapping-initial experience. Radiology 2000;214:467-75. 11. Gatehouse PD, Rolf MP, Graves MJ, Hofman MB, Totman J, Werner B, et al. Flow measurement by cardiovascular magnetic resonance: A multi-centre multi-vendor study of background phase offset errors that can compromise the accuracy of derived regurgitant or shunt flow measurements. J Cardiovasc Magn Reson 2010;12:5. 12. Holland BJ, Printz BF, Lai WW. Baseline correction of phase-contrast images in congenital cardiovascular magnetic resonance. J Cardiovasc Magn Reson 2010;12:11. 14. Hourihan M, Colan SD, Wernovsky G, Maheshwari U, Mayer JE Jr, Sanders SP. Growth of the aortic anastamosis, annulus, and root after the arterial switch procedure performed in infancy. Circulation 1993;88:615-20.